As travelers, there are certain rites of passage associated with destinations around the world, whether it be hiking Asia’s Annapurna Circuit, climbing Africa’s Mt. Kilimanjaro, or diving the Great Barrier Reef in Australia. Once completed (or, in some cases, endured), they become badges of honor that intrepid adventurers will one day tell their grandchildren about. 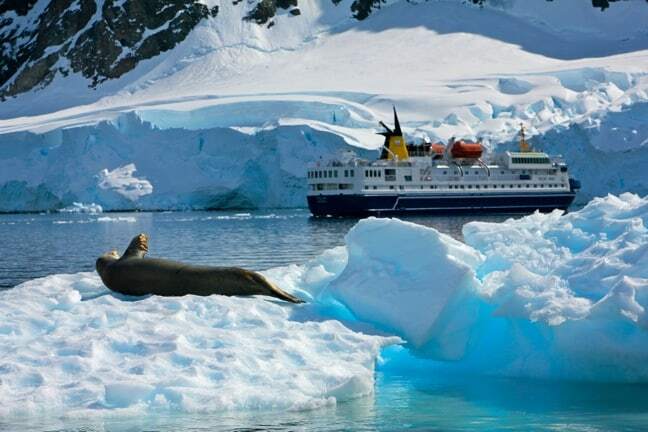 From the moment we found out that Adventure Life was sending us to Antarctica for a week-long cruise around the South Shetland Islands and the Antarctic Peninsula, one of the first questions on my mind was, “I wonder if we’ll get to do the Polar Plunge? !” Mary, who you may recall has a fear of water and a dislike of cold, did not seem nearly as curious. Antarctica XXI, the Chilean company that operates the cruise, was intentionally cagey about our Polar Plunge possibilities. Their literature suggested we bring swimsuits in case we stopped on an island with volcano-fed hot springs, which seemed a bit suspicious since I’d never heard of such a thing. It wasn’t until the day before we did the Polar Plunge that we knew it was going to happen. I was clearly gung-ho about taking a dip in the sub-freezing waters, but Mary was decidedly non-committal. The ship was positively buzzing with excitement: Only a dozen or so of the 50+ passengers were crazy enough to take the Polar Plunge, but EVERYONE seemed eager to watch. As we gathered on the bottom deck in our plush bathrobes, the energy in the room built to a fevered pitch, until it felt like a locker room right before a championship game. The guys all had their game faces on, but we were far outnumbered by ladies whose unmasked emotions belied their inner bravery. “Really?!? !” she exclaimed nervously as they strapped the cold floatation device around her midsection. But, sensing her fear, everyone began cheering Mary on. “You can do it!” I assured her. Gamely holding the GoPro camera on her face, she stepped towards our New Zealand guide, Ben, and looked around nervously at frigid Antarctic landscape. She made the tragic mistake of dipping her toe into the shockingly cold water, but before she had time to second-guess her decision Ben gave her a 1-2-3 count and she was in the water! Her reaction when they pulled her out, as you’ll see in the video, was absolutely hilarious: Raw, emotional, exhilarated and just plain damn adorable. Mary was the talk of the ship that day, and with good reason. It’s one thing to be bold and brave and do a cannonball that splashes your guides with freezing cold water, but it’s quite another to be scared as hell of something and yet find the gumption within yourself to do it anyway.